The cable gland also known as cable connector is a device designed to connect electrical devices, which provides support, sealing, retention, insulation, and earthing. Explosion proof cable glands, also known as sealing glands or strain reliefs that facilitate barrier penetration and offer sealing protection. They can be utilized with probes, wires, power, and signaling cables. Manufacturers offer an extensive range of Explosion-proof cable glands depending upon material, mode of utilization, cable size, type of cable, pressure range and others. Explosion-proof cable glands are used to increase safety in hazardous environment with features such as high load bearing capacity and robust design. Apart from sealing wires and cables, these glands provide other functions such as earthing, environmental protection, ingress protection, and strain relief. Increase in the number of refineries and rise in need for safety, drive the explosion-proof cable glands market. In addition, wide applications in various sectors that include oil & gas, mining, chemicals, manufacturing & processing, and others. However, high material cost restricts the growth of the market. Moreover, explosion-proof cable is used for underground mining to increase safety in drilling and excavation operation. Such factors are expected to offer lucrative opportunities in the future. The key players operating in the global explosion-proof cable glands market are CMP Products Limited, Bartec Feam, Elsewedy Electric, Weidmller Interface GmbH & Co., Jacob GmbH, Hummel AG, Eaton corporation plc. (Cooper Crouse-Hinds, LLC), Emerson Electric Co. (Appleton Grp LLC), Amphenol Industrial Products Group, and Cortem Group. The market is segmented into type, cable type, material, end user, and region. Based on type, it is categorized into increased safety, flameproof, EMC, and others. Based on cable type, it is bifurcated into armored and unarmored. The material segment is divided into brass, stainless steel, plastic/nylon, and others. The end user for the market include oil & gas, mining, chemical, manufacturing & processing, and others. Based on region, the market is analyzed across North America, Europe, Asia-Pacific, and LAMEA. With rise in production of diesel, gasoline, and jet fuel, developments in heavy refinery projects such as installation of regasification plants, increase in conversion capacity, and upgradation in refining, there is a requirement for installation of explosion proof cable glands, which boosts the demand for explosion-proof cable during the forecast period. The government of various countries across the globe have made it mandatory for the industries working in a hazardous environment to follow proper safety measures for the operations to run smoothly. Safety equipment such as explosion-proof cable glands provide protection from the uncertain and hazardous environments such as dust and explosive gases. Thus, the government plays an important role to fuel the demand for explosion proof cable glands. The raw materials used to develop explosion-proof cable glands include brass, steel, plastic, and others. The unstable prices of these essential ingredients have affected the global market. This is responsible for the growth of the Explosion-proof Cable Glands Market in the future. Porters Five Forces model illustrates the potency of buyers & sellers, which is estimated to assist the market players to adopt effective strategies. 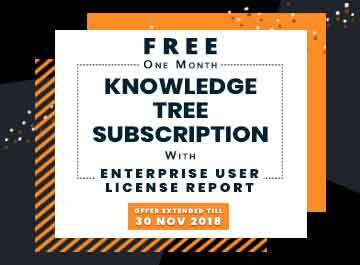 The key market players are profiled to understand the strategies adopted by them. The cable gland also known as cable connector is a device designed to connect electrical devices, which provides support, sealing, retention, insulation, and earthing. 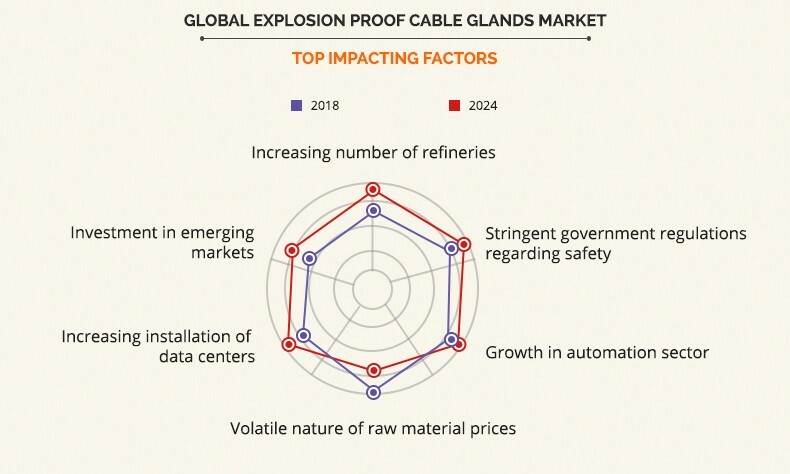 The global explosion proof cable glands was valued at $174.9 million in 2017, and is projected to reach $269.4 million by 2024, registering a CAGR of 6.4% from 2018 to 2024, due to the increase in number of refineries and stringent government regulation regarding safety. Based on type, the explosion proof cable glands include increased safety, flameproof, EMC, and others. 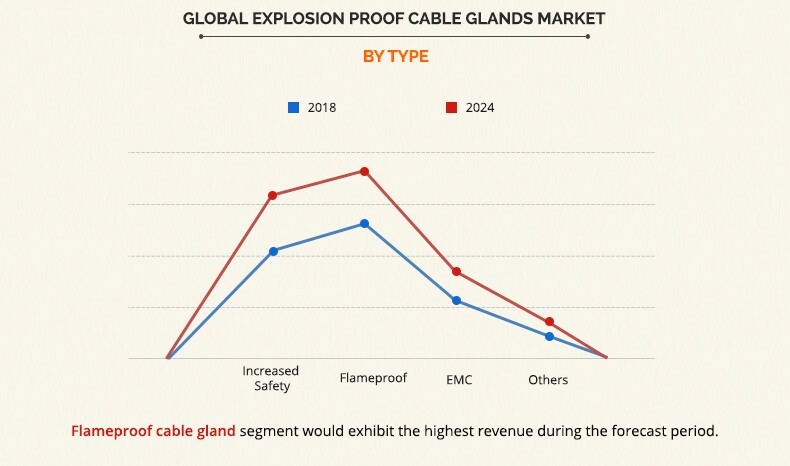 Flameproof contributed a significant revenue to the market, majorly from the U.S. By cable type, the armored segment is anticipated to witness the highest growth rate during the forecast period. Furthermore, based on region, Asia Pacific was the highest contributor, in terms of revenue, to the explosion proof cable glands market, in 2017. 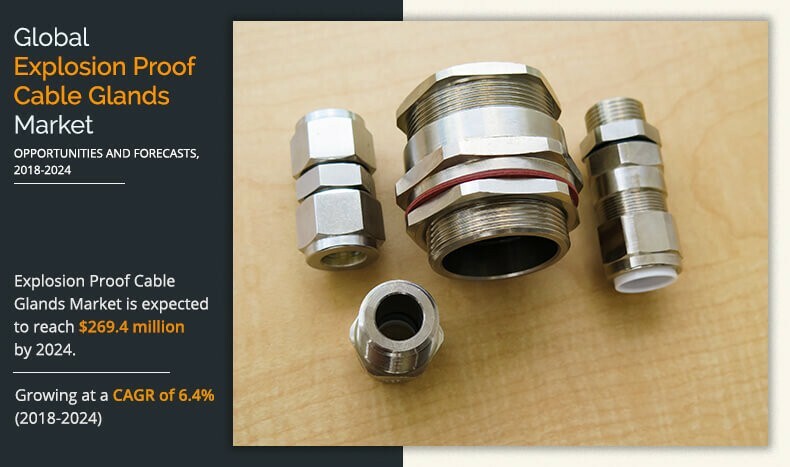 The key market players have adopted various strategies, such as new product launch, business expansion, and strategic alliances to increase awareness about the explosion proof cable glands market across various countries.